36’ - Barrett flew into the frame like original marathoner Pheidippides running to tell Athens the Persians had been defeated. Sounders find a second before the half with Chad Barrett finishing off a set piece, and they're looking very good for the #CCL quarters. 39’ - Chad Barrett just scored off a Marco Pappa cross. And then he celebrated by faking an injury. Tonight is a great night. 43’ - Vancouver… does not look good. HT - Your @SoundersFC are 2-0 leaders over the Whitecaps. 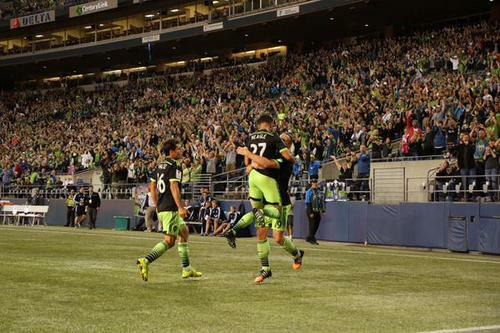 Just 45 minutes separate Seattle and the #SCCL knockouts. If Seattle wins this game (LOOKIN’ GOOD), it’ll be the 1st home win in the series this year. Thank you, @wsdot_traffic , that we’re all here. If you think Friberg should legally change his name to Firebird, RT this. There is no fav option. You also must RT this. SKC lost today. And Benny Feilhaber picked up a card and will miss Sunday’s game against Seattle. If you were curious. 46’ - And we’re back for the second half at CenturyLink Field. 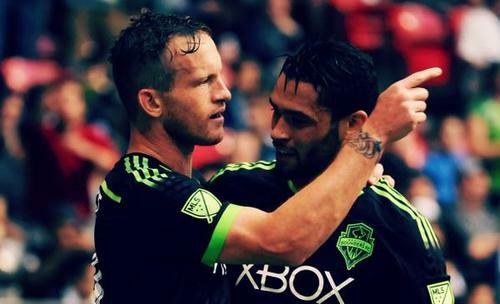 2-0 Sounders, FYI. 2-0. 2. 0.